With Tony Parker and Kawhi Leonard healthy, the Spurs appear poised to make a run at Oklahoma City as the top team in the Western Conference. It’s setting up to be an incredible finish. Battles for seeding and a spot in the Western Conference playoffs will likely go down to the wire, LeBron James and Kevin Durant are putting on a spectacular show in the race for MVP and the Heat continue to push the Pacers for the East’s top spot. Heck, even other teams out East, like Toronto, Chicago and Brooklyn, are finally proving worthy of the postseason. Note: NBA rankings are updated each week before Wednesday’s games. Every superstar has his signature night: Michael Jordan had his "Flu Game," Kobe Bryant had his 81-point game and Magic Johnson had his "Magic at Center" game. Now, LeBron has his "Mask Game," after scoring 61 points to beat the Bobcats. Make sure you’re watching, one of the greatest players of all-time is playing the best basketball of his career. There’s little more Houston can do to prove how dangerous they have become. The Rockets have the league’s best record (21-6) since the new calendar year and they’re coming off a home win against Miami. OKC is more than just a pretty offensive face. Sure, Kevin Durant and the Thunder’s scoring gets all the attention, but the defense separates them. OKC is ranked No. 4 in the league for defensive efficiency, points allowed per 100 possessions. The Pacers had won five straight despite not playing their best basketball, but the last-second home loss to the visiting Warriors stings. Miami continues to apply more pressure as Indiana clings to the East’s No. 1 spot by two games. It’s going to be a close finish. Here’s where San Antonio makes its run. There was little to no decline in playing without their best players, a product of a ridiculously proficient system that has continued to run despite 24 different lineups this season. 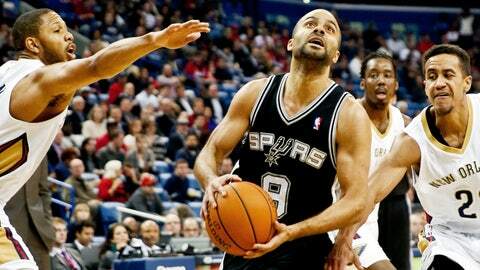 Now that Tony Parker and Kawhi Leonard are back, the real Spurs have arrived and are just a step behind OKC. Best actor in a leading role: Blake Griffin. Best actor in a supporting role: Chris Paul. Hollywood is full of surprises. Griffin is arguably more valuable than Paul this season and if that argument is even close, that says plenty about Griffin’s overall progression. We knew Portland would make a run after the All-Star break, playing seven of their first eight games against losing teams. But that stretch ends Wednesday against the Hawks. Then the real test begins, as Portland hits the road against four of the West’s top-nine teams: Dallas, Houston, Memphis and San Antonio. The Warriors earned a huge victory in Indiana thanks to Klay Thompson’s heroics, including 16 fourth-quarter points and the game-winner. The Warriors have now won six of eight since the All-Star break and are trending back in the right direction. A win in Boston would mean a 4-2 road trip, which would be huge in this dogfight for a bottom playoffs spot. Is there a Vegas prop for the Grizzlies making it into at least the second round of the postseason? Memphis has a winning percentage of .739 (17-6) since Marc Gasol returned, the most wins in the league and third-best defense since that date. Joakim Noah is playing like the best center in the league and a top 10 player. That’s no joke. Despite all that’s been sucked from the Bulls, the team is tied for the most wins in 2014 (21) thanks to Noah’s spirited presence. Credit Tom Thibodeau, D.J. Augustin and Kirk Hinrich, too, of course. The Raptors are for real. The Raptors are for real. The Raptors are for real. Say it three times and you start to believe it. Remember this prediction: The Raptors will give either the Pacers or Heat a run this postseason (you know, like a five-game series). Also remember: This team was supposed to tank. 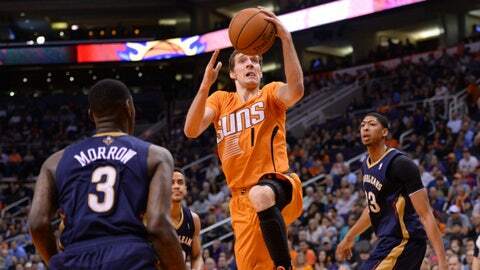 The Suns have a winning percentage of just .200 in games decided by three points or less. As the schedule gets tighter down the stretch in the competitive West, those losses might be what ousts Phoenix from the postseason. It’s part of being an inexperienced team. Dirk Nowitzki might not be quick enough to win at musical chairs, but Monta Ellis certainly is. The Mavs will need both of them playing at an elite level if they hope to nab a chair in the postseason when the music stops in 21 more games. Dallas is just a game ahead of No. 9 Memphis, and one of these West teams will be the odd man out. The Nets hit a season low on Dec. 31 at 11 games under .500. Since then, the Nets are 19-8 (.701) and are back to .500 for the first time since they were 2-2 on Nov. 5. Look out, as Brooklyn is now just three games behind the Bulls for the No. 4 spot. Poor Michael Kidd-Gilchrist. The second-year defensive player was roasted by LeBron for 61 points, a night after having to guard Kevin Durant ("holding him" to 28 points). Don’t forget, Carmelo Anthony had his 62-point night this season against MKG, too. It’s going to take a miracle finish to somehow leapfrog two of the top nine teams in the West. The schedule lightens for Minnesota — NY, DET, TOR, MIL, CHA, SAC — but even Kevin Love’s MVP caliber season won’t be enough for a late rescue in the tough West. John Wall is a total throwback to the mid-90s star point guard. He’s got a swagger and competitive drive of the old school. He’s a PG who, believe it or not, actually makes his teammates better. He’s also about to lead the Wizards into the postseason. There’s no better tradition in sports than the Atlanta Hawks losing early in the playoffs. And it looks like the springtime ritual will continue, as neither Detroit or Cleveland is going to challenge for that eighth spot. A first-round ousting via Indy or Miami is now in order. Anthony Davis is really raising "eyebrow" this season with his 20 and 10 average. By the way, is there a worse trademark in the league? It’s too late to start waxing that thing at this point though. Maybe it fits: He’s the ONE good thing about the Pelicans. If George Karl was coaching this team ‘¦ they’d still not be good enough to make the playoffs. There’s no one on this roster who shouldn’t be shopped this offseason besides, maybe, Ty Lawson. Big changes are needed. Andrew Bynum admitted to shooting half-court shots and mocking a Cavs assistant coach as the prelude to his departure. When you look at the disruption that has pained this Cavs’ losing season, you get a pretty good Public Service Announcement on why losing teams need to chase high-character guys. If DeMarcus Cousins has a 20-and-10 night, does anyone know if it doesn’t come with a technical foul? The 23-year-old center is dominating the stat sheet, but he leads the league with 15 techs, placing the attention on whether or not he’ll ever be a mature leader. Does Joe Dumars get to keep his job if the Pistons make the playoffs with a record 10 games under .500? He shouldn’t. Of course, a worse decision would be to do what NY Daily News columnist Mitch Lawrence is reporting as a possibility, and replace Dumars with Isiah Thomas. You have to wonder what the total count of postal letters Jazz GM Dennis Lindsey received asking for Utah to acquire Jimmer Fredette. Was it more or less than Richard Jefferson’s total minutes for the year? There’s no practical reason for Kobe Bryant to return this season. But it wouldn’t be a surprise if he did. His competitive drive may lead him back on the floor, and it’s an opportunity to prove to himself and free agents that he can still ball. You think Kobe is enjoying all these conversations about LeBron being the clear best player since Jordan? No way. When LeBron signed with the Heat, it was labeled, "The Decision." If Carmelo Anthony decides to stay in New York this summer, we can label that one, "The Wrong Decision." As the team implodes more and more, Anthony’s decision-making becomes easier. Of course there are more factors involved, but NY is not making a good case to bring him back. If it wasn’t for playing the Sixers (two wins) and Knicks (one win), the Magic would not have won a game in almost a month (since Feb. 9 vs. Indiana). The Celtics are about to miss the postseason for the first time since the 2006-07 season, when they finished last in their conference. How did they bounce back after that? Boston won the NBA Championship. It isn’t that easy, but Boston fans post 2001 aren’t used to being down for long. The gravestone for the 2013-14 season reads: Tanking in Peace (now that Gary Neal’s gone). Neal was traded to Charlotte, and recently vented that he didn’t get minutes in Milwaukee because the team was tanking. Come on, how could the 76ers not bring Allen Iverson back to play in the game when they retired his jersey? This whole second half has been one big joke already, right? Well, I guess the fear is A.I. might have led them to an accidental win.